So, as I noted last year, I was taking a hard pause from late 2018’s flagship titles, largely because I had more than enough games to keep me occupied. But it’s 2019 now, which means that I’m allowed (by my own rules) to play whatever I like. And Spider-Man (PS4) has been stupidly cheap of late, so it was a rather easy title to pick up. It does feel weird to be playing something that was hyped so very heavily “out of sequence” with the general hype cycle. In a lot of ways, I actually think I’ve appreciated it more this way. I’ve certainly appreciated not having to rush through it to either run a review or avoid spoilers. Just about every single aspect of this game is a known entity. If I’d wanted to, I could have watched complete run-throughs of every mission, side mission, collectible or trivial gag online. I could have done that without even buying the game! Which I did not do, because I was rather too busy enjoying this generally exceptional game. Yeah, I’ll get back to that “generally” in a second. I’ve been playing games based around Peter Parker (and the now-much-wider-Spiderverse) for quite some time now. Yes, there have been some really woeful games, all the way back to the Atari 2600 Spider-Man game. This makes it look a LOT better than it is. Trust me. This was also a stinker. And it often feels like I’ve played them all. I was wary going into Spider-Man PS4, simply because the debt it owed to the Rocksteady Arkham games was evident from day one, and if I’m honest, I’d hit a fatigue point with those games. They’re good, no doubt, but I felt like I’d played enough of them. Thankfully, Insomniac Games did a good job of taking that basic framework and applying it to the way a Spider-Man game should work, although that didn’t occur to me at first. Just prior to playing Spider-Man PS4, I’d been playing quite a bit of the Shadow of Mordor games, and I approached Spider-man with the same kind of tactics… which meant that poor Peter got squashed a lot, and I got a little frustrated early on with the combat. Still not sure how Peter doesn’t break his ankles every time he lands, mind. The thing is, Spider-Man fights in the game like he does in the comics, which means it’s not just kinetic, but specifically fighting in a genuinely 3D world. If you don’t zip around, use your webs and change your plans on the fly, you’ll get squashed like one. Once I clicked with that, the game became much more enjoyable, in the main. Yeah, it’s a gorgeous game. I’ve only been playing it on a regular PS4 – surprisingly, my launch PS4 continues to struggle onwards, although it does sound like a jet engine these days – but upscaled on a 4K TV, it’s a stunning acheivement of both graphics and art design. 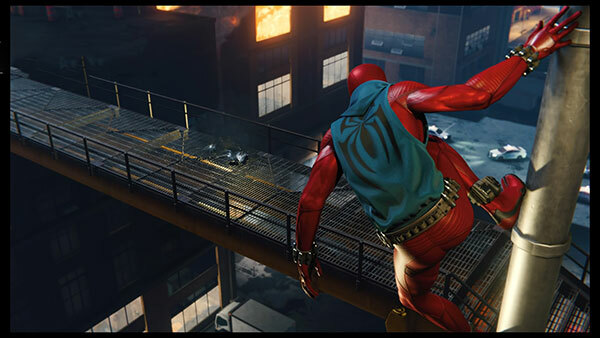 The additional costumes are a lot of fun – I’m a sucker for a Spider-Man 2099 costume – and the enemies look as they should. Spidey, on his way to a “swingers party” is about to get a big surprise, especially in that suit. So what’s not to like? The cookie-cutter side missions are in some cases annoying, like those drone missions where you have to fly through blue orbs. Did we learn nothing from Superman 64? The bosses look and sound just right, but with few exceptions they’re rather predictable, and as a result easier to beat than many of the mook rushes. The combined Vulture/Electro battle was easily the most fun battle, and I’ll give the Doc Ock fight at the end a pass, but that’s more to do with the emotion at the end, which is fundamentally down to the strength of the voice acting. I like the web powers, but I’m stymied as to why you get Web Blossom so early on. It’s the cheesiest attack, and once you’ve got it, the other powers are cute to play with – but they were rarely my go-to choice. Making it available later in-game would have made me experiment more. could easily see him sued by Forbush Man. There’s also a LOT of collectibles. I’d be lying if I said I didn’t get into the backpack ones, but that may have been due to the fact that I could sing the stupid Dora The Explorer backpack song and annoy my kids every time I found one. Not sure that was the developer’s intent, but there you go. The issue there is that they do stretch the game out, and not really with “value” content… just stuff that takes more time to complete. I’ve hit around 90% completion, and, honestly, I think I’ve done as much as I’m going to. What’s left are the retakes on the challenge missions, a few of the landmarks and that’s about it. I’m not yet sold on the idea of spending up on the DLC, given there are other games to play – anyone got any feedback on that?